The Sony PlayStation VR (PSVR) virtual reality headset officially went on sale in the UK just over a week ago. Those interested in the new VR HMD from Sony, who haven't already splashed the cash on one of these devices, are likely to be scouring the internet in search of the best deals. Meanwhile less-lemming-like individuals are probably thinking about giving a PSVR a test drive, to see if it cuts the mustard, before a potential purchase. 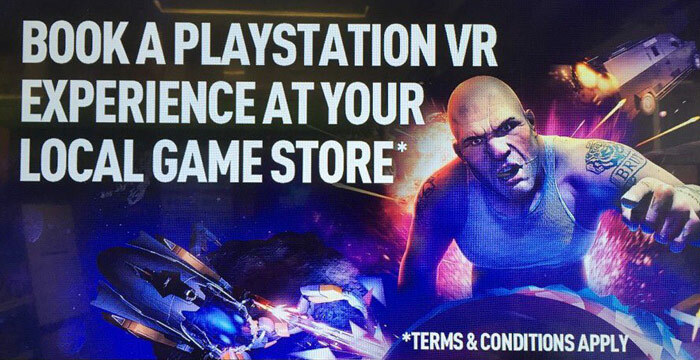 This weekend a UK games retailer with a strong bricks & mortar presence, GAME, kicked off an initiative to allow orderly access to PSVR demo units. As reported by EuroGamer, many a GAME store Tweeted about the 'deal' to promote it. 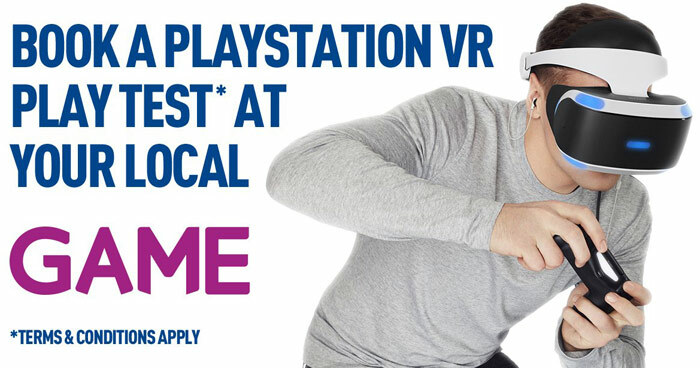 The idea is that GAME provides potential customers with a supervised and guided 'experience' with the PSVR and various games titles. In return the customer has to pay £5 for 10 mins of pre-booked time, £10 for 20 mins, or £15 for 30 mins. There are ways to avoid the fee or get it refunded. To swerve the fee altogether you need to have proof of having paid for a deposit on a PSVR from GAME. Alternatively on the day of your demo session you can get a refund by going ahead and making a PSVR purchase. EuroGamer revealed that at the beginning of a demo session a GAME staffer will brief you about how to operate the HMD and what you will experience. During your demo you must not stand up, you must be calm and not erratically move your head and limbs, you must not touch the HMD or other equipment unless otherwise directed, and you must stop moving if the GAME assistant puts a hand on your shoulder. If the demo gets too much for you, you are advised to raise a hand and close your eyes to await rescue. There have been quite a lot unhappy responses concerning these paid, scheduled demos of the PSVR at GAME. However others might see the demo as good value and as a reasonable measure by GAME to minimise the negative effects of Showrooming. What do HEXUS readers think? Makes sense to me, if its just pop along an have a go it will be constantly filled with people with no intention of buying. Likewise it does take staff time, and depreciation of the headset so it makes sense to charge. I really think having a demo available is a good thing to drive sales. Having tried the Vive demo @ OCUK it really sold it to me and the wife and the demo was free!! Would have liked to have purchased it from them as a way of rewarding them for making the demo available but they put the price up early and Game were still at the old price so had to get it from them (£70 difference!). Or go to curry's and try VIVE for free. And that's at either Leeds; Reading; Tottenham Court Road or Staples Corner? Or are more stores offering demos? Booking a demo is the only way to go - you can't let people use a VR headset unsupervised. It's good value, but I don't want to share germs with people, who from their appearance/odour, still have a designated bath night.